While not the most exciting food, this soup can be made in a thousand different ways with whatever is on hand. I think it’s no secret to anyone that we love our cabbage in Russia. Not necessarily by choice. I mean, it’s not like we had a nice spread of vegetables to choose from growing in the Russian soil. Many Russian dishes feature cabbage, and soup is no exception. 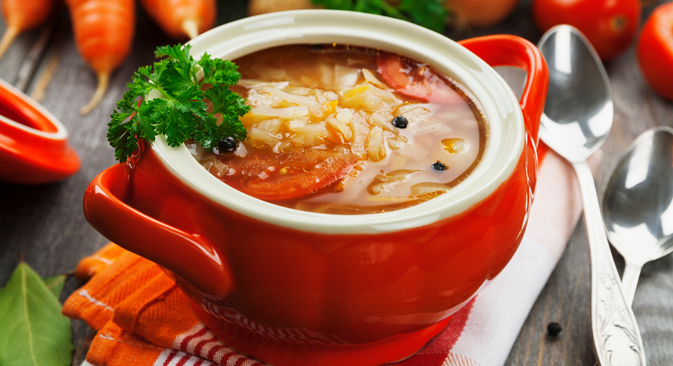 Schi, or cabbage soup, is probably the second most popular soup in Russia after borsch, although it is a lot less exciting. I grew up with Granny’s schi, which consisted of cabbage and broth, with the occasional addition of meat. She would serve it with some homemade croutons which, to be honest, were the most exciting part of it. I was a little bit surprised to read that the recipe in the Book also includes potatoes, tomatoes and carrots. Just as well it did, too, because I had my Australian in-laws to test it on, and I didn’t think they would be terribly excited by the idea of having boiled cabbage and broth for dinner. The quality of produce in Australia, where I went for a holiday visit, is very high and as a result the soup turned out nicely and was well received. At least my in-laws said they enjoyed it, and I’m just going to believe they were sincere. As it turns out, my grandmother did the same for my brother and me. When she made us regular schi, she also made pickled cabbage schi – just for herself. She would then ask us with a cheeky smile: “I don’t suppose you would like some sour schi?” We would exaggerate just how put off we were by the idea of it, and that would give Granny great satisfaction. She loves the idea that her Russian limit is much higher than ours. She learned about sour schi from her neighbor in the communal apartment, who would lure her in saying: “I bet your mom doesn’t cook this for you.” I am positive that Granny, known to have been a very picky eater as a child, grew fond of the soup partly so her mother’s job feeding her wouldn’t become any easier. The neighbor was a “simple” woman from a village and brought the recipe with her when she moved to Moscow. To create the Soviet Union’s society of equals, former nobles were housed under the same roof with farmers, writers and government employees. Recipe sharing flourished – made a lot easier (and kind of necessary) in the set-up of a communal kitchen. Often when I ask Granny whether she knows a certain dish or recipe, she will say: “We never made it, but our flatmate such and such made it a lot – she was from Kazakhstan/Latvia/somewhere else.” There were also always stories of my great-grandmother teaching the neighbors to make Jewish challah and how they never, never could get it right and suspected great-granny of holding back on a crucial part of the recipe. The Book’s version of the well-loved schi is one that is certainly worth sharing – wherever your flatmate might be from. And I think I’ll share it with my grandmother, too, just to show off how my Russian cooking horizons have expanded. Start cooking some meat in broth. After 1 ½ hours, remove the meat. In a soup pot, add pre-roasted root vegetables and onions. Then add the meat and chopped cabbage. Cook 30-40 minutes. Five to 10 minutes before the end of cooking, add pepper, salt and a bay leaf. Potatoes and fresh tomatoes can also be added to the soup. If you want to cook this option, peel and slice the potatoes. Put them in the pot 10-15 minutes after the start of the cooking. Add the tomatoes, in slices, at the end of the cooking time, along with the spices. For 500 grams of meat, use 500 g fresh cabbage, 200 g of root vegetables and onions, 2 tbsp. oil and 200 g tomatoes.